A faster, easier way to shave with nothing to lose but the mess of foams and creams. And what you'll gain? A premium, supremely moisturizing, and perfectly lubricating formula. These sticks are about exactly the same size as a stick of deodorant, and packaged exactly the same. The different scents listed on the website are Pomegranate, Baby Powder, Sweet Mango, Island Breeze, Lavender, and Unscented. They run $9 apiece. I haven't seen these in stores, and I believe the only place to purchase these at the moment are through their website. Truthfully, I'm not much of a shaving cream girl. The castile soap in my shower lathers just fine, so I was skeptical of this product. 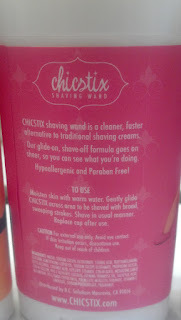 However the ingredients and the claims their company make have made me second guess my previous shaving strategy. Ingredients: Coconut acid (anti-inflammatory, good for sensitive skin), Allantoin (causes skin to soften and bind moisture more effectively), Vitamin E Linoleate (antioxidant and anti-inflammatory), Evening Primrose Oil (anti-aging, firmness, better elasticity), Salicylic Acid (treats acne, also helps to soften and loosen dry, scaly, thick skin so it can be removed easily). 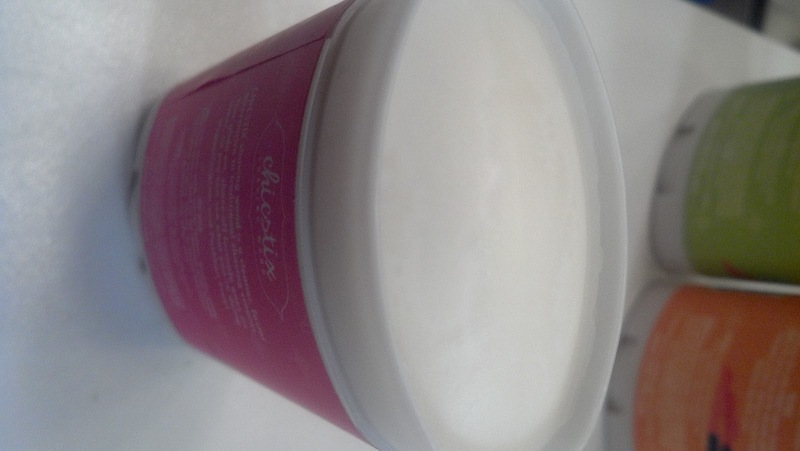 No more lathering up! The consumer provides the water- not the product. Most shaving creams and gels are 60% or more water. Chicstix are solids. 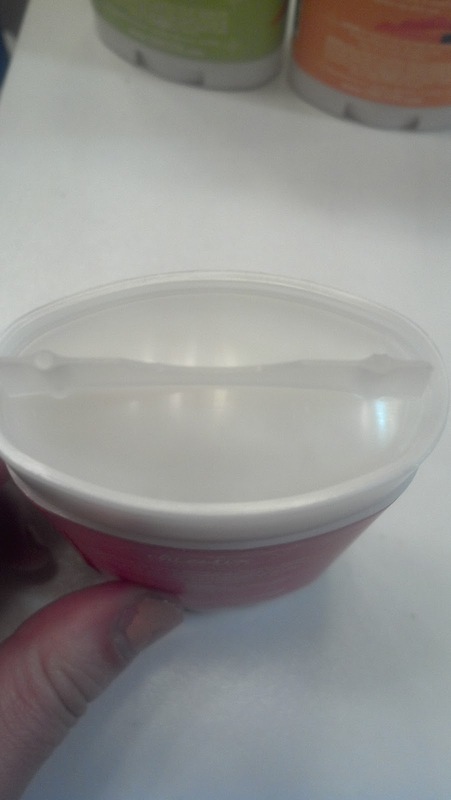 This causes the product to last longer, be more eco and budget friendly! The inspiration for this product began with the launching of the same product for men. It got such rave reviews they decided to come out with a brand and scents for females. With my husband traveling a ton for work lately, I am definitely inspired to grab some of these up for him! The package design is travel friendly (follows the airport guidelines) and small. You can easily fit this in your carry on. I was skeptical at first, but I really enjoyed using these. I actually think the messy foams and creams work more quickly to get your shave done, so the claim that the stick is easier and quicker didn't really work for me. However I normally don't spend quite this much time or energy devoted to my shaving techniques, so that could have been part of it! 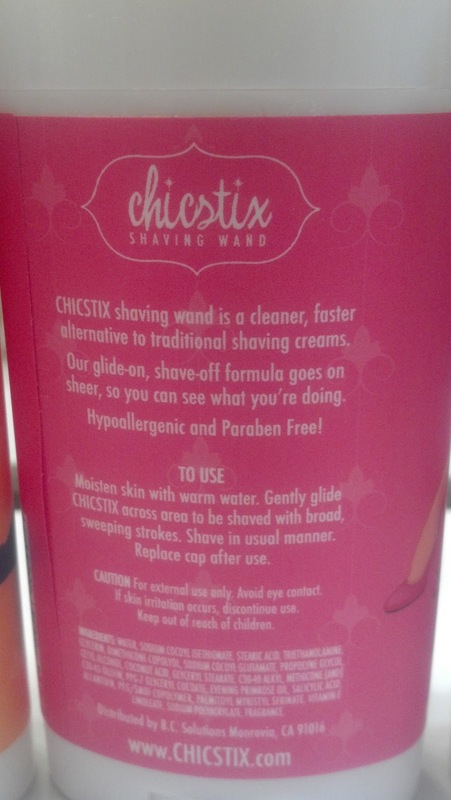 The texture of the product is exactly like I would imagine shaving with deodorant to feel like! I swiped it over my leg after I got it wet in the shower and it was a little sticky, and went on mostly sheer. When I shaved, I covered about 1/3 of my leg each time with the shave stick and removed the hair, then moved on to the next section. I did notice that the tiny pieces of my leg hair would get attached to the stick each time I moved on to the next section, and when I'd swipe my leg again, it would feel like I was exfoliating my leg. This didn't really bother me and was an easy fix- just rinse it off. I took longer in the shower than usual because my shaving routine was different. It will take some getting used to. I will say I think I was able to get a closer shave and I don't feel like my razor got clogged or stopped up like it sometimes can when using a thick cream to shave with. I also didn't notice a soap scum or a slippery bath tub after using this product. It truly just did its job and went right down the drain. My legs feel smoother than normal. Wahoo! I can never get a super close shave on my underarm area. Just checked and it looked like I did a fantastic job shaving. Normally, I shave my underarms every morning, and if I am going out later and wearing a tank top, I run a razor over them one more time, just to be sure. Normally I also get bumps from shaving under my arms, where I've tried to get close and I've irritated my skin. None of those today! I used Mango and the smell was wonderful. For those of you are sensitive to smell, I don't think you'll have an issue with these products. If you do, you could try the unscented. The smell was light, and not overwhelming. It wasn't like those body washes that fill up your whole shower with a scent. It was more like there was a very small hint of a scent, but it was light and clean. 1. I returned the cap to the product, but it was wet on top. I want to see if it coagulates or is slimy or if I have to peel off the top layer to use it again, or something else equally gross. 2. I want to see if I truly got a closer shave. Wouldn't it be sweet if I didn't have much outgrowth for the next couple days? 3. I want to see how much longer my under arms stay hair-free. I'm normally an everyday shaver, but it won't be necessary today! Just checked my underarms. There are a couple places where a tiny sliver of hair is coming up, but otherwise they are totally clean. My legs are almost perfectly smooth, albeit a little dry. But, that's a normal issue for me. There would be no reason to shave today, because I don't really have much hair to speak of! If I was going somewhere special, I'd probably consider shaving. I'm a little bit prickly, but nothing too serious. I wouldn't have considered shaving until later at night when a little more hair had sprouted. Underarms are starting to grow hair. I shaved again today. When I opened the stick, it was perfectly normal and there was no mess. So much for thinking that living in the shower was going to ruin the product with moisture! This time I tried a different method for shaving. Last time, I had complained that when I swiped the stick, shaved, and swiped again, little hairs got all over the stick and it made it feel like I was exfoliating. This time, I swiped the stick across my whole leg, and rubbed the product in with my hands. I shaved my leg and was wonderful! Smoothing the product around really made a difference in the way my shaving went. I got a super close shave, and it left my legs even smoother than last time. 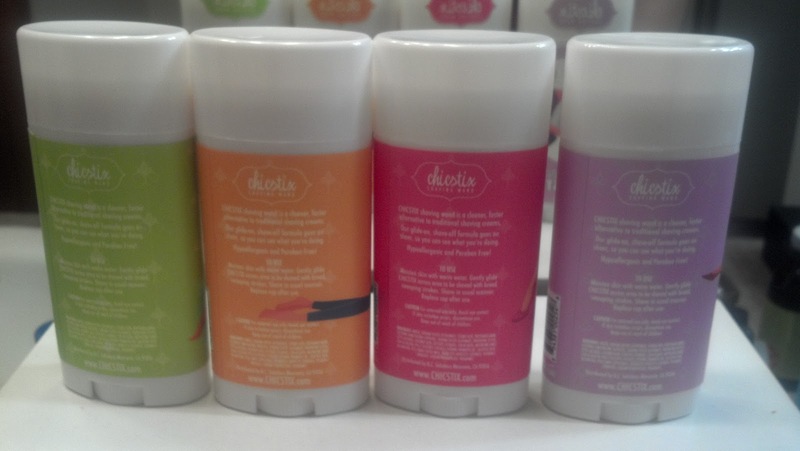 These products were sent to me for review by Chicstix company. My opinions are honest and my own. I would recommend this product to anyone looking for a close shave or an alternative to shaving gels and creams. Especially for travel! Enjoy 50% on their website with this code! Make sure to "like" Chicstix on Facebook here and thank them for the awesome coupon code. We will also be reviewing one of their men's products for that man in your life so stay tuned for future shaving posts! Oh these sound nice! Do you know how long the coupon is active for? I'm broke this month but I really want to try this. These sound really fantastic and perfect for traveling! The fact that you get such a close shave from them is great! Very intrigued! I can ask the company. Mike is going to get a men's stick sent to us. He has huge problems with the ingrown hairs on his face. He has very curly facial hair and it gets trapped in his pores when he shaves and causes massive bumps and infections. We are going to give the men's product a try for him and see how it works. I'm sure the coupon will last at least until he's done trying. If not, I'll ask for an extension. Did you check out their website?